1. Wear something you'd be able to wear to work. Even though you're technically not at work, you're still at work. You don't want to be showing off things you'd normally hide in the office and this isn't a New Years party with all of your friends. The thing about being around work people, close friends or not, is that you'll always be around work. 2. Caution on the side of conservative. 99% of the time if you're asking a friend if your outfit is too risky for a work party, it usually is. If you're going back and forth with, "Is this too short? Tight? Revealing? Low?" or anything else, you shouldn't wear it. Re-read No. 1 as to why. 3. Let your accessories make your outfit. Holiday parties are fun! It's also a time to spruce up your look (without breaking rules No. 1 or 2) and I think that can be done with fun accessories like a statement necklace or earrings (but never both), a couple of fun bracelets, and lipstick. Easy enough, right? That's where I found inspiration for this look. 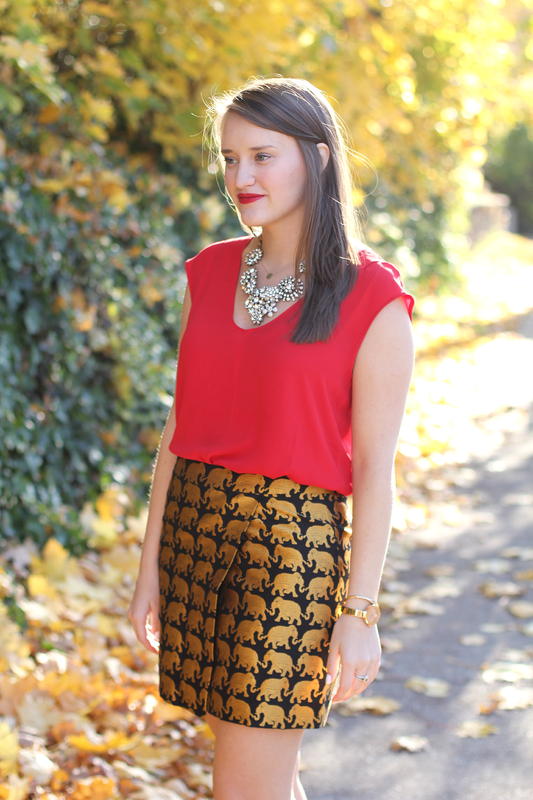 I love to wear lots of red and gold around the holidays and some fun sequins here and there for the more special events! 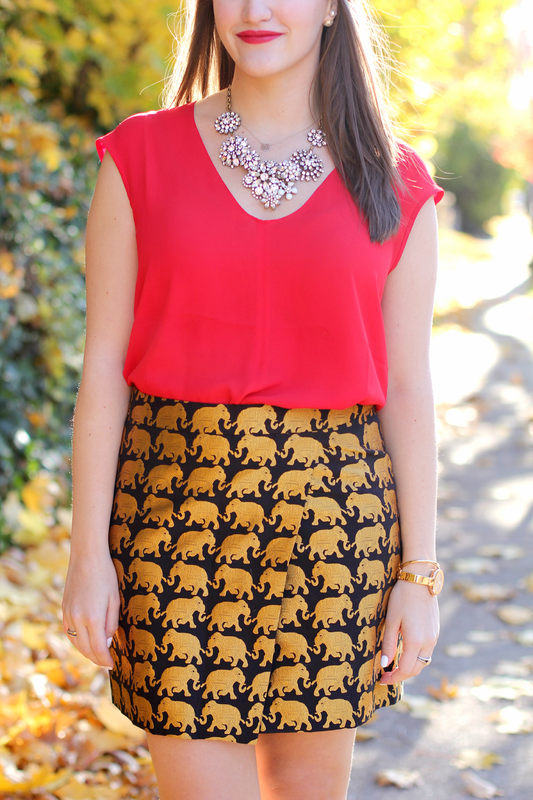 So this elephant skirt and red top were sure to be mine the moment I saw them. Sure it's a little early to start planning, but I know it will sneak up on me before I know it. I'll actually be sharing three holiday looks this week so be sure to stay tuned! I love this look! 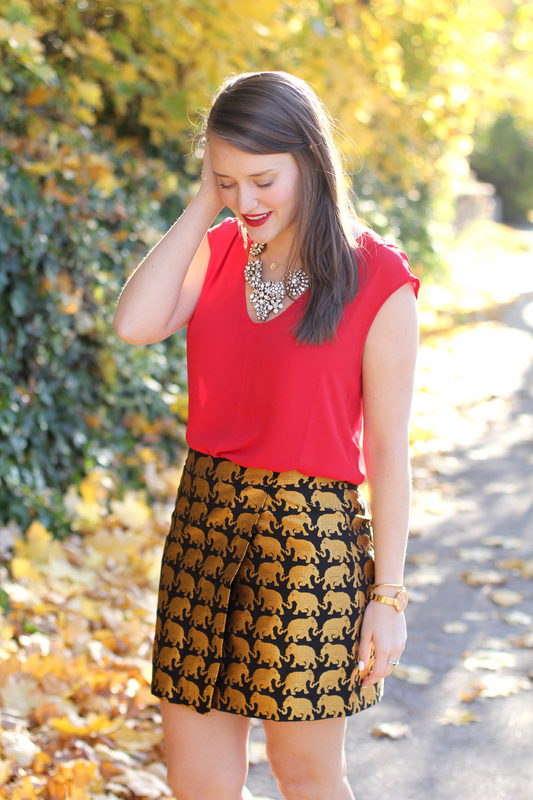 That skirt is perfect for the holidays! What a gorgeous necklace! I love it! And great tips for holiday parties! 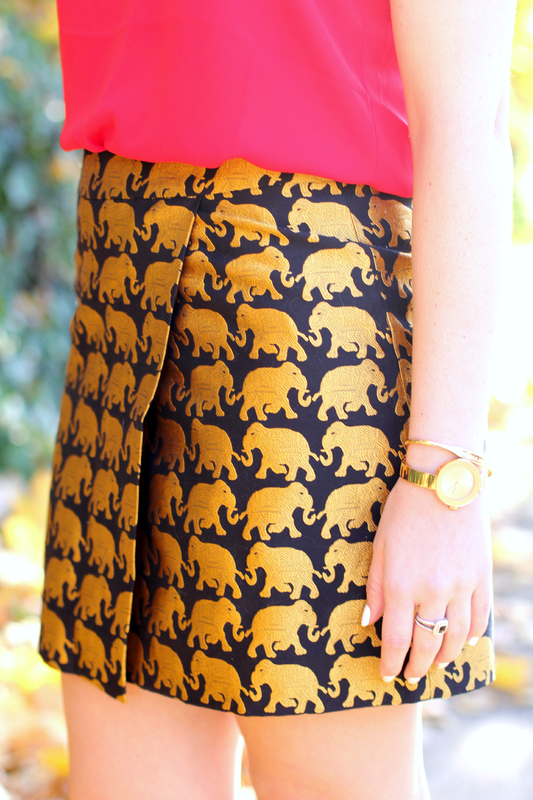 What a great skirt - love the elephants! I remember seeing a crewcut dress in this print and thinking that I needed to squeeze into it because i loved the print. I got so excited when I saw you post this skirt on instagram because I am obsessed with it and can't wait to get my hands on it. It really is such a gorgeous print and so perfect for the Holidays. 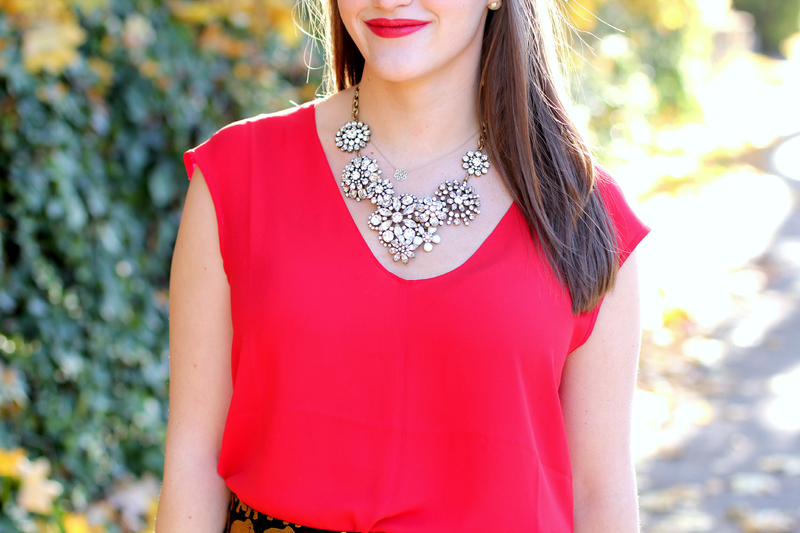 Definitely a great piece for a holiday party! You are looking ravishing in this dress and I am grateful that you shared your dressing ideas here. I am also going to an office holiday party and it will be great if you can share some corporate party ideas of dressing for me.